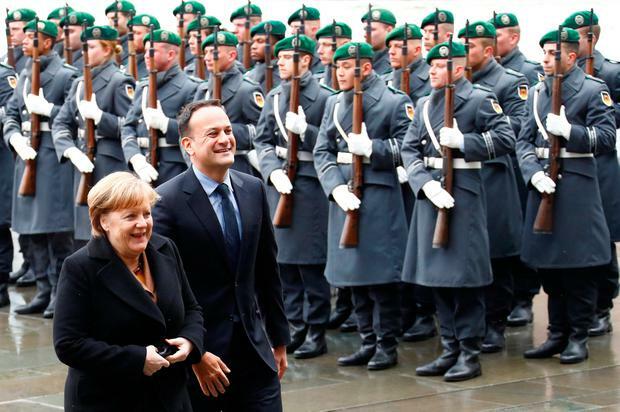 German Chancellor Angela Merkel said Ireland can "rely" on Germany for "unconditional" support during Brexit negotiations. Ms Merkel was unequivocal in her support for Irish concerns over British withdrawal from the EU. Following a meeting with the Taoiseach in Berlin, she said: "Ireland may rely on us and it is unconditional - that is a matter of fact per se." Leo Varadkar was greeted with military honours for his first official visit as Taoiseach. Mr Varadkar went on a charm offensive, speaking in German during the joint press conference. Ms Merkel's statement will be helpful ahead of tomorrow's EU summit, where leaders are due to sign off on a draft, incomplete version of the UK's Withdrawal Agreement for leaving the EU. The Withdrawal Agreement contains the Irish protocol dealing with the obligations of the UK to avoid a hard Border in Northern Ireland. It includes the backstop scenario which compels Britain to keep the North in the customs union and apply EU regulations if a better solution is not forthcoming on the Border. But, so far, the Irish part of the agreement is largely unresolved and requires more negotiation from Britain. Several people are sceptical about the UK's reliability in this regard and wonder whether Britain could renege on its word, as it appeared to do when December's deal - where the backstop scenario was initially devised - was transcribed in legal form. Fianna Fáil Brexit spokesman Stephen Donnelly said there were serious doubts about the value of this week's deal. He said Britain has been busy "rowing back" on its initial commitment to the backstop. He also accused the UK of merely agreeing to it in order pass the mark to get to the next phase of EU-UK relations. The Tánaiste denied this. David Chance Brexit may have disappeared from the headlines thanks to a talks extension, but that doesn't mean we have dodged a bullet - it's just that the day of reckoning has been postponed.